Castelli's exciting new partnership with Team Sky produces a compromise between the warmth of the Gabba and the weight of the Perfetto vest, introducing the Perfetto 2 light. It has the same construction as the Gabba but castelli have used a nano light pro fabric on the back which allows your body to breath so you don't overheat. The Perfetto 2 will have you protected on those cooler days where it is dry or a little light rain is expected and with an incredible fit for a piece of foul weather kit. The 2017 jersey design brings a sort of British-Italian fusion. Designed by Richard Pearce, the graphic celebrates the victories in Team Sky’s first 7 seasons. The classic Breton shirt served as inspiration but has been reimagined in a data pattern with each stripe on the Castelli Team Sky Long Sleeve Thermal Jersey representing a specific Team Sky victory. 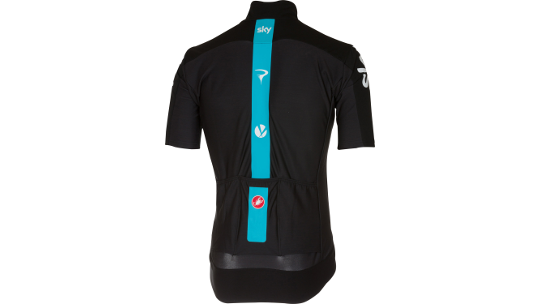 The longest lines are the 4 Tour de France victories, with Chris Froome’s 2016 victory immediately below the Sky logo on the chest. The short dashes represent one-day races, while the medium-length lines represent multiday stage races, with the number of stages determining the length of the line. WorldTour races are blue lines, while non-WorldTour races are white. Perhaps most significantly, the gaps represent the ambition for future victories. 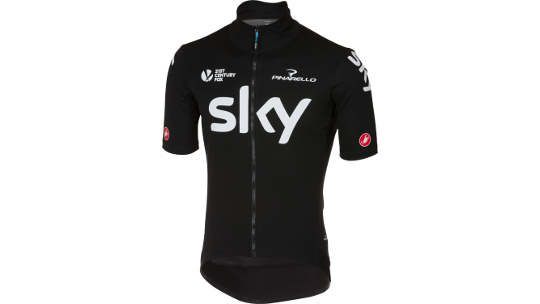 The front of the jersey is made up of victories by 2017 team members, with the exception of Sir Bradley Wiggins’ 2012 Tour win, which has a special place in Team Sky history.